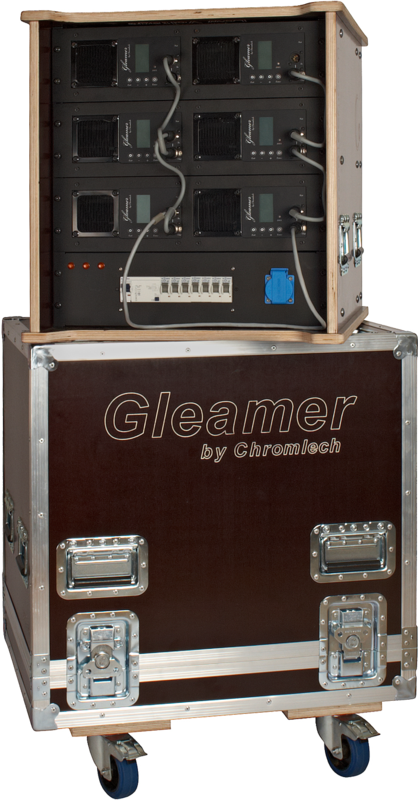 The ACT Lighting team was in full force showing the new Chromlech fixtures including the Gleamer low voltage lighting dimmer. It allows control of any low voltage lamp individually and without external transformers. Nine DMX channels provide independent control of any low voltage lamp within a fixture. Handles any set of low voltage light sources from 6v – 28v. MA was showing the onPC Command Wing. 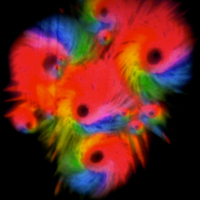 A control wing that is used in conjunction with their free grand MA on PC software. It is a portable 2,048 parameter control wing that enables the look and feel of the software to be as close to a real grandMA2 console as possible. 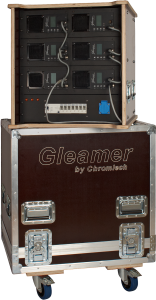 ACT is the North American Distributor for: MA Ligting, Clay Paky, MDG, Wireless Solutions, GDS, Tourplex/Datasure cables, and Chromalech. 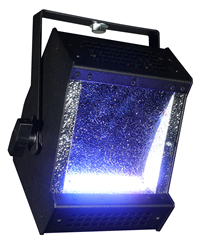 Airstar is a company that makes and sells diffuse lighting for film and entertainment. They have a variety of balloons and inflatable devices to light large areas. As some may know there has been a Helium shortage world wide so their fan inflatable and fan stand models have been invaluable. Another aspect is the ability to add graphics to the products both for sale and rental. They can drop ship to each office or to site which ever we prefer. They can also retrofit graphics to existing products or previously sold. There are a large number of round options and they have shapes that are versatile like tubes and horns. Altman Lighting introduced a 50W and 200W cyc to their full Spectra Cyc range, as well as a recessed version of the Chalice house light. Both units are available in 4 standard configurations: RGBA, RGBW, 3000K, 3000K-6000K tunable white. Also in the booth were the new LED Spectra Cubes, which are a 50W wall wash luminaire utilizing red, green, blue and amber or white LED emitters. Designed for use on 4’ centers, individual units can be linked side by side for greater saturation of light. 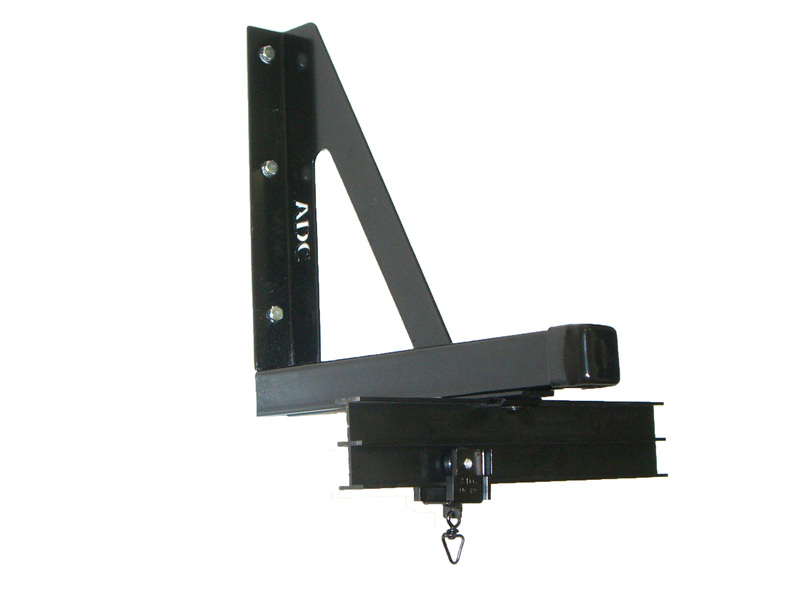 All models have a double yoke for floor use or can be hung via a C-clamp or track mount applications. The Chalice house lights are controlled via DMX or can plug straight into your current dimming system with its phase control option. It has around 40 3W LEDs making its light output equivalent of a 575W fixture. APOLLO introduced a series of colored gobos designed for LED fixtures. The PrintScenic line is offered in Glass or Plastic and offers full color gobos at a very affordable price. 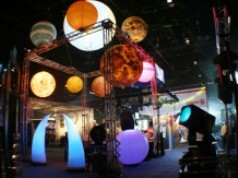 Apollo came to LDI with a newline of LED fixtures to show . 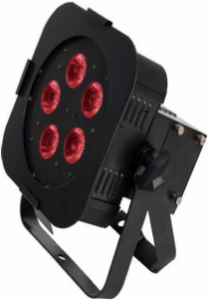 The Spotlight LED Profile Zoom and Fresnel are offered in White LED’s in both 100 and 200 Watts. A 250 Watt Profile Zoom is offered in an RGBW color mixing fixture. Apollo is also proud to announce that they will be distributing the Get-a-Grip line of C-clamps formally produced and distributed by Lighting & Electronics. Applied Electronics was showing their wide line of products from dimming and control to truss, roof, lifts and power distro. Also in their booth this year was Australian company LSC with their Clarity PC/Mac based lighting and media controler. Available in four sizes providing from 1 through to an amazing 128 Universes, Clarity is capable of handling small shows right through to pixel-mapped LED walls on a large scale. The software is highly configurable and easy to use. LSC also offer hardware support products in the form of DMX output devices and control Wings. Three DMX output devices QX1, QX2 and QX4 are available providing 1, 2 and 4 DMX512 outputs respectively. Two control wings VX10 and VX20 are also available and offer playbacks, master control and in the VX20 control buttons and a trackball. All QX and VX devices can be interconnected - so a VX20+ 2 x VX10 + 1 x QX2 can all be used on a single system to provide extra playbacks and increase the number of DMX outputs. Arri has improved and expanded their L7-C LED Fresnel that was released last year to include a new active cooling model that has removed the power supply and replaced it with a fan module. While nominally increasing the sound of the unit, removing the power supply significantly lowers the weight of the unit. Also in addition to the standard silver and blue model you can now also get the L7-C in a black and blue unit. 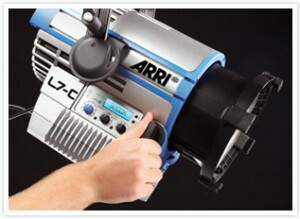 For those looking for more punch in a smaller package Arri has come out with their M90 Fixture. Like their current smaller M series fixtures, using Arri’s MAX Technology, the new M90 fixture has an output close to a 12K Par, in a housing similar to a 6K Par. Powering this new fixture is a newly designed 9K lamp from Osram. 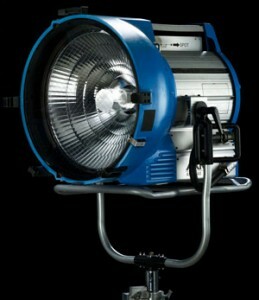 The lamp is the same size as a 6k lamp and can also be powered by Arri’s EB6000/9000 ballast. ADC were showing some handy curtain track accessories at this year's LDI. Model 1483UNI Wall Bracket- New wall bracket which can be used to wall mount the entire line of ADC track systems. A slotted mounting surface allows the tracks to be easily adjusted from 4" to 12" from the mounted wall. The bracket is designed to work with bi-parting or one-way draw track systems. You can have them substitute your company’s logo for theirs shown in the image here. ModelSTRUTBR Wall Bracket- New fully adjustable wall bracket which can be used to wall mount the entire line of ADC track systems. 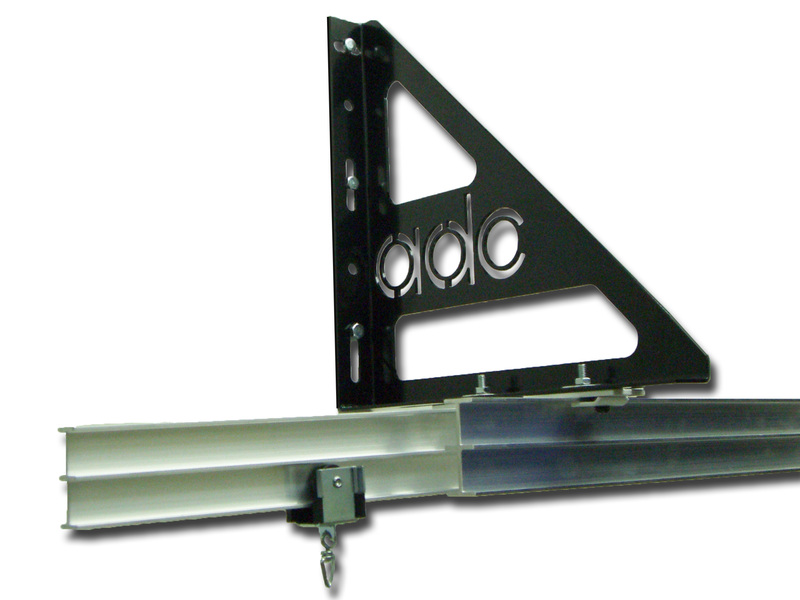 A strut channel mounting surface allows the tracks to be easily adjusted from 0" to 12" from the mounted wall. The bracket is designed to work with bi-parting or one-way draw track systems. 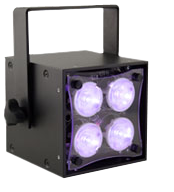 Using their same 4” x 4” compact form factor, Black Tank now offers their fixture in three varieties; RGBW (using 4 quad led chips), Variable white (using a mix of tungsten, daylight, and neutral white chip leds), and a Ultraviolet version. All models consume approx. 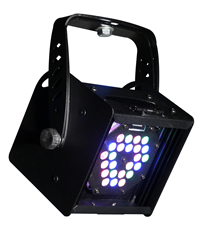 50W of power and include a powercon input, dmx input, and dmx output. Despite their compact size, these fixtures output approx. 1600 lumens. Accessories include a variety of spread lenses and mounting options, including a lighting track mount option which is great for retail and museum applications. Black Tank has now teamed up with Rosco Laboratories for all their sales and distribution and will continue to operate as an engineering firm developing new products for them. Cast's Black Trax is a real-time solution for tracking people and objects, using sophisticated technology that is amazingly simple to set up. Tracking for automated lights was the main focus of the demo I saw. The system requires a few elements, cameras, Beacons (IMU), Time Keeper and a calibration kit. 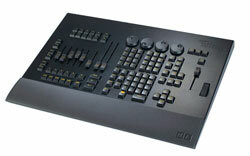 Then you need your fixtures and console and a WYSIWYG CE. To get the absolute most basic you could use only 2 cameras but for the most accurate system 6 is recommended. These need to be placed to cover you tracking area 45% off center. Your tracking area can range up to 20 meters (65’-7”). Focus your cameras to cover your tracking area which can be done w a few different ways. The next step is to Calibrate the tracking area using the calibrating kit. Basically you paint the area using infared from LEDs starting from center. The system will tell you when you have enough information. Next you calibrate your fixtures, which is really quite easy. What does not fall within calibration from your layout can be calibrated with a 4 to 5 button pushes using the Beacon. The Beacon gives you Y Pitch & Yaw with the IMU installed. It uses one LED which the camera uses to focus on. Take out the IMU and put on three LED instead of just one and you can now track a piece of scenery. X, Y,Z, roll, pitch. The CAST team ran the Black Trax System through several demonstrations for us including , free form Remote control floating Shark. That impressed me as there is no way to really pre program that. They had light tracing after a remote control car that was pretty cool as well. All and all the System impressed me with it’s seeming ease of set up and the repeatable accuracy( less the ¼”), not to mention the speed at which the tracking can be reassigned to the next set of beacons.